Some species of chameleons, but not all, can change the colour of their skin. The principal reason to the change of tone is not the camouflage (mimicry) but the manifestation of certain physical or physiological, or emotional states such as fear. For example, during the fighting, they take, in general, shades more vibrant, as a form of threat to the opponent. Finally, the temperature also affect the coloration and the light conditions. 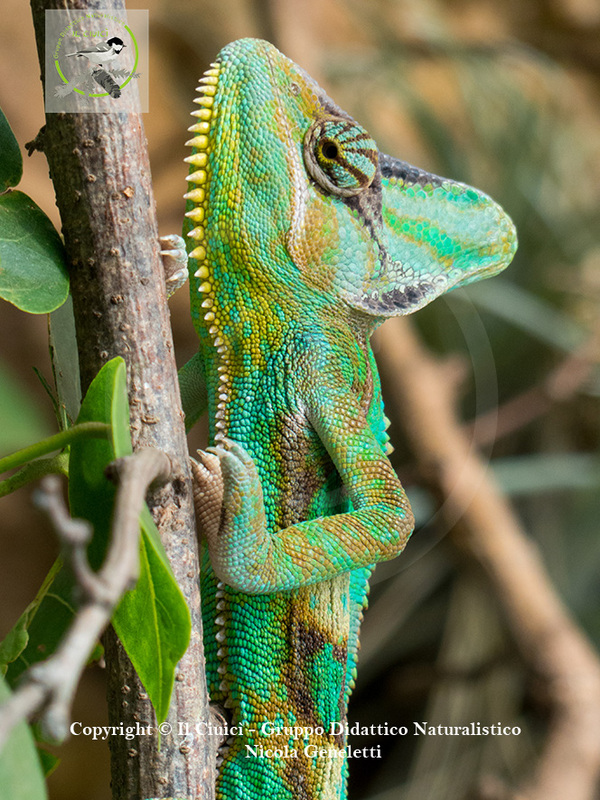 The chameleon’s capacity of changing colour is due to some layers of specialized cells that are located under the transparent skin of the animal. The cells placed in the upper layer containing yellow and green pigment. Those of the lower layer containing a crystalline substance coloured called guanine. The guanophores (cells of guanine) reflect a part of incident light, in particular blue or white light. If the chromatophores above are yellow, blue light reflected produces a green colour. Below the layer of guanophores and chromatophores there is a third layer of cells melanophores containing melanin. This layer can darken or lighten the colours produced by the overlying strata. camouflage, Chamaleo calyptratus, chameleon, chromatophora, color, dancer, fighting, guanine, guanofore, melanin, Reptile, skin, temperature.